Create links to previous or next value of a State. A state-based previous/next link provides a way to automatically link to consecutive state values. The link updates automatically if you make changes to the State’s values. It is commonly used to create forward and back buttons for a carousel or slideshow. You configure the component by attaching a state, and specifying text and whether the link goes forward to the next value, or backward to the previous value. 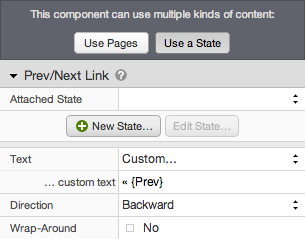 Text A state-based link can update its text automatically based on the values of the attached state. You can choose to display the name of the current value or the name of the value that will be set when the link is clicked (the “next” value). Direction Whether the link goes backward to the previous value or forward to the next value, as shown in the state’s list of values. Wrap-Around This setting only applies when there is no next (or previous) value. When to Yes, the link “wraps around” to the beginning (or end). When set to No, the link is simply disabled.